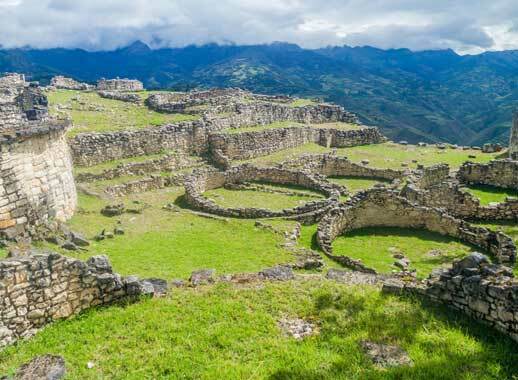 This is a holiday of exploration, in which you delve into the cultures that inspired the Inca Empire and which had withered away before the arrival of the Spaniards. Travel from coastal deserts where fabulous tombs lay hidden in giant mud-brick pyramids to misty mountain tops with breath-taking stone fortresses. 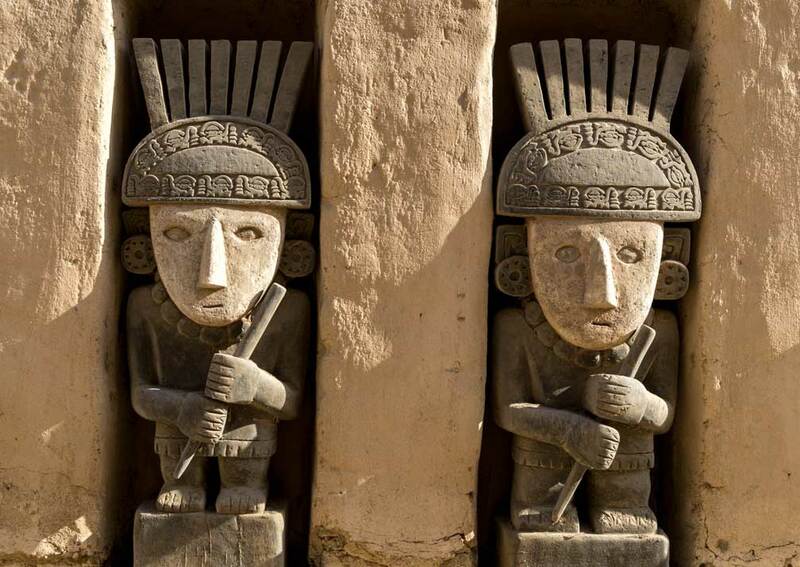 Uncover a side of Peru that has been overshadowed by Cusco and the Incas. Before the Incas conquered most of the Andean mountain chain, many different cultures thrived in the highlands and on the Pacific coastal plain of Peru. 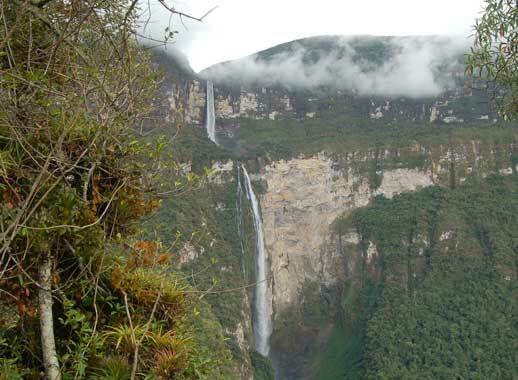 This trip showcases four of those cultures, the Moche, the Chimú, the Lambayeque and the Chachapoyas. 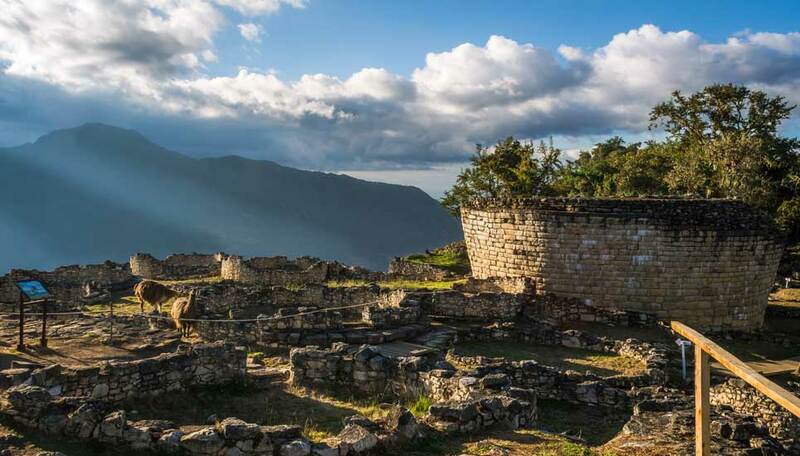 Archaeologists have been making stunning discoveries in the adobe cities of the first three and at the Chachapoyans’ stone fortress of Kuélap. 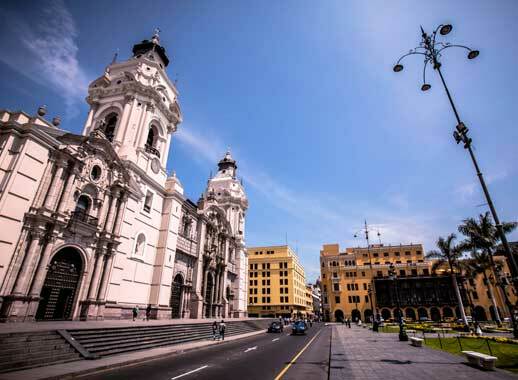 You will visit these historical sites and the purpose-built museums that support them, as well as private tours to some of the most important sites in Lima. 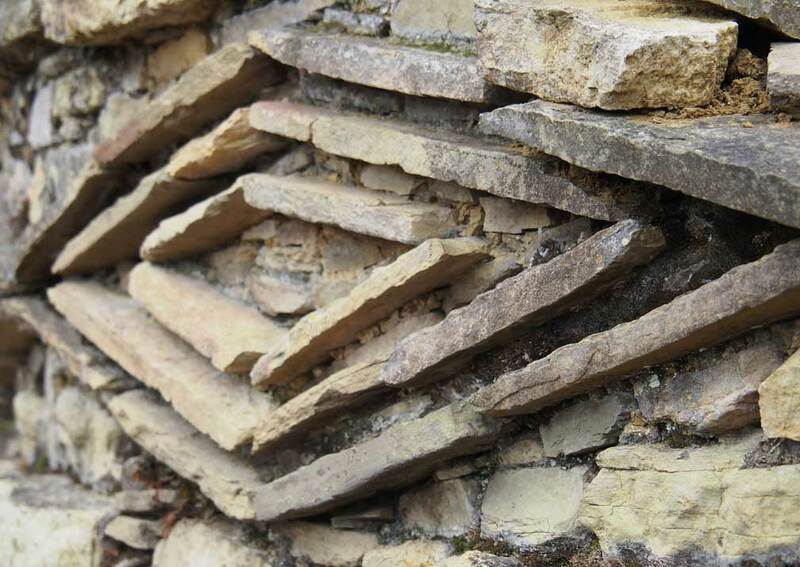 The trip is not solely archaeological, however. You will visit Huanchaco, a delightful ocean-front town close to the city of Trujillo. It is known for fishing and surfing and the way these two activities are combined in the traditional craft of the fisherfolk: reed boats, called caballitos (little horses), which ride the waves. Needless to say there are plenty of seafood restaurants. 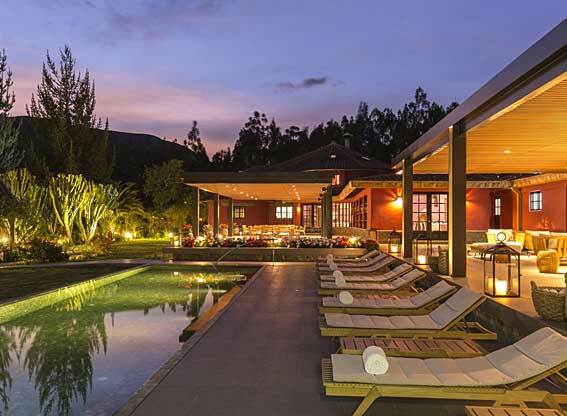 Your journey will take you by road from the Pacific coast over one range of the Andes to the valley of the River Marañón and beyond, to the waterfalls and clouded peaks of the next Andean range. 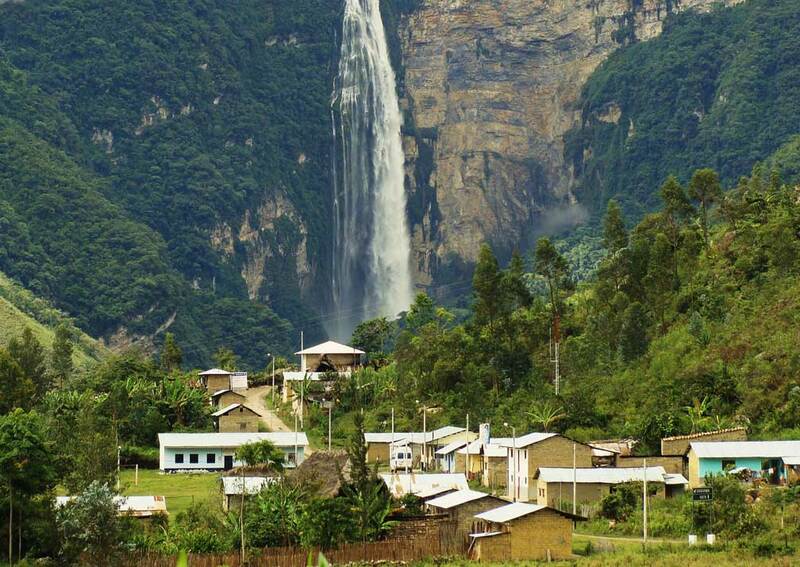 Your goal here is the Gocta Falls, until relatively recently a well-guarded secret and as you trek to the foot of the falls you will appreciate why they evaded the world’s attention for so long. 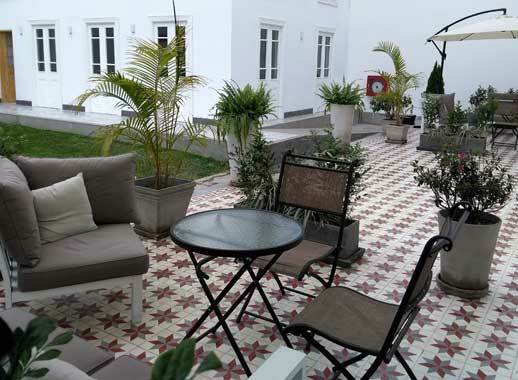 Fly to Lima today, where you'll be met and taken to the Casa República Hotel in Barranco. This district is 40 minutes from the airport (traffic permitting). Now the artistic quarter of the capital, with lots of galleries, restaurants and bars, it was built as the city’s weekend retreat for the wealthy. 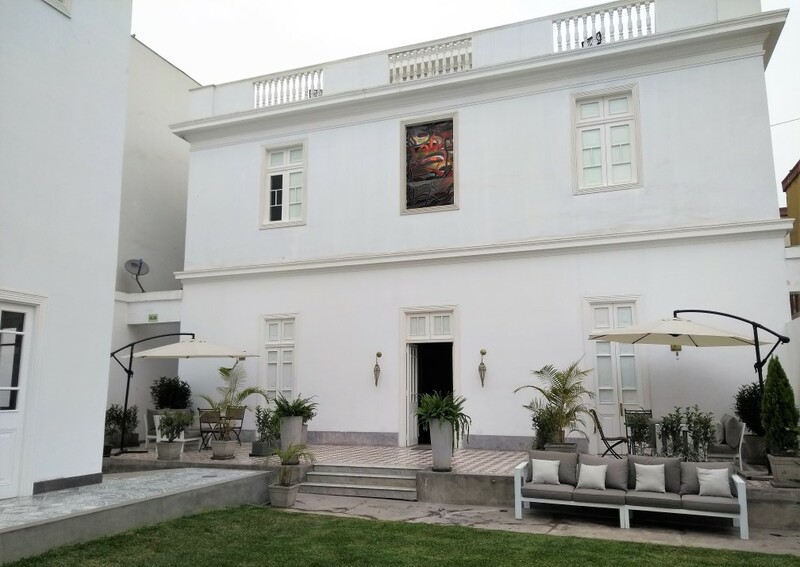 Casa República dates from this era and is a beautifully converted 1920s mansion, the perfect place to relax after your flight. You have a quiet morning to relax and explore at your own pace. 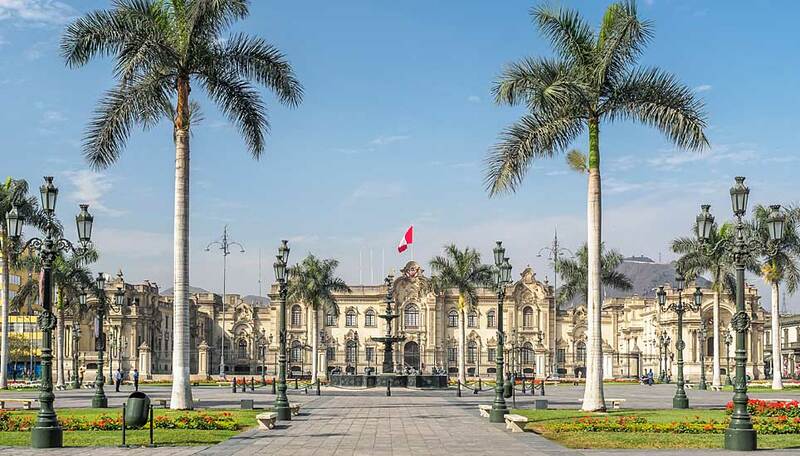 In the afternoon you will visit two historic sites in Lima. 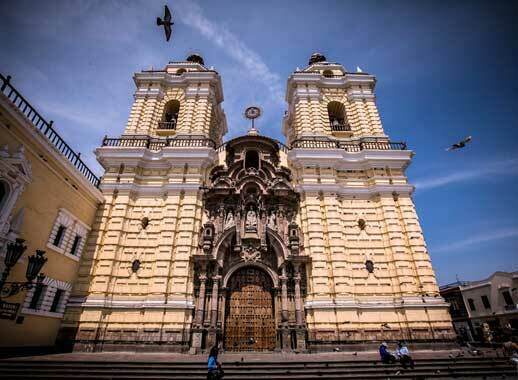 The first stop is San Francisco church, decorated in colonial baroque style, with an accompanying monastery, library and fascinating catacombs. 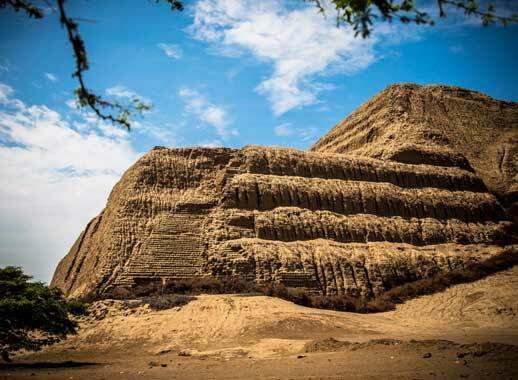 Between the centre and Barranco is Miraflores, a busy commercial, hotel and residential district, and here you will visit the Huaca Pucllana, a large adobe-brick pyramid and ceremonial complex built by the Lima culture between 200 and 800 AD. It is quite a contrast to the modern city blocks that surround it. After the tour you will be taken to the airport for the flight to Trujillo, 1 hour to the north. 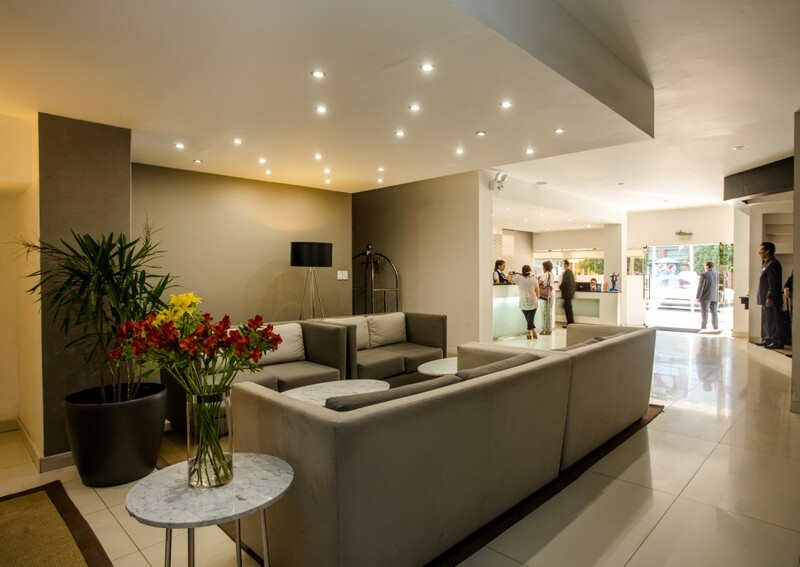 You will be met off the plane and transferred to your hotel, the Costa del Sol Trujillo. You will be collected from the hotel after breakfast for a full-day tour of sites near Trujillo. 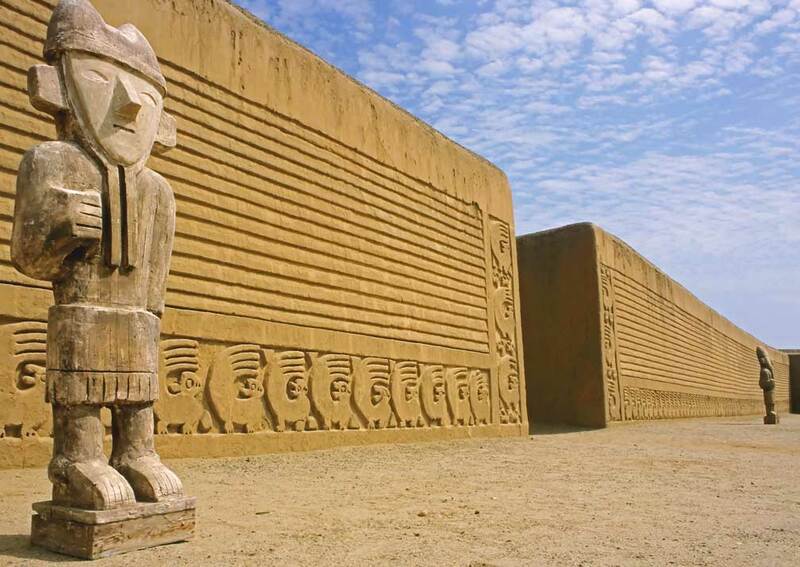 To begin with you will visit the Sun and Moon Temples (Huaca del Sol and Huaca de la Luna) of the pre-Inca Moche culture (100-750 AD). On the way there you will stop at the workshop of present-day Moche crafts people. The Sun Temple is a massive structure, which was largely destroyed by the Spanish conquistadores, but the Moon Temple, a truncated pyramid, is yielding layer upon layer of multi-coloured friezes and images of Moche gods and warriors. Then you will head from southeast to northwest of Trujillo to the Dragon Temple, also called the Rainbow Temple because of the friezes that decorate it. After lunch in a local restaurant you move on to Chan Chán, the imperial city of the Chimú culture (from about 600 AD until being conquered by the Incas in 1471). Chan Chán was at one time the largest adobe city in the world. Of the 10 great compounds enclosed by its walls, one can be visited, the Nik An Palace. You will be able to see the layout of the palace and the remarkable moulded decorations on its walls. 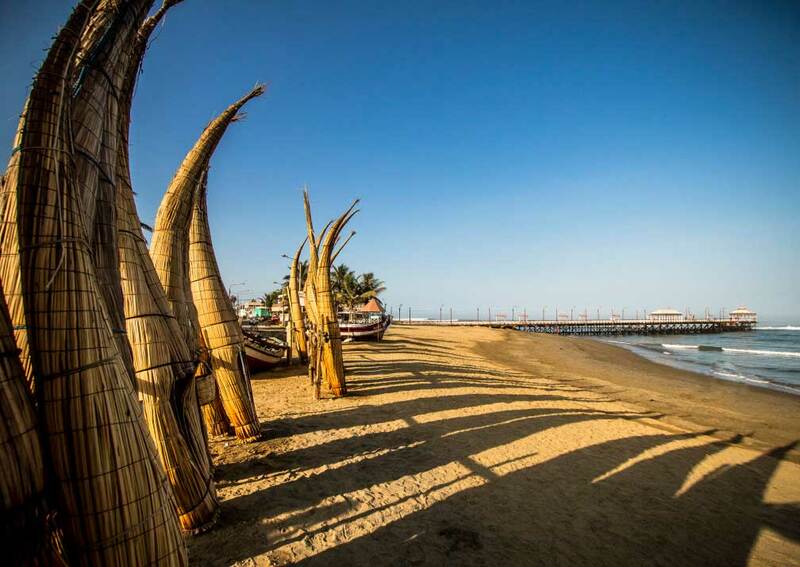 Finally the tour goes to Huanchaco, a few kilometres away, the main beach resort for Trujillo, where you may see the fishermen’s traditional reed boats. From here you return to your hotel in the city. You make an early start today and head north of Trujillo to El Brujo, The Sorcerer archaeological complex. This was an important religious and ceremonial centre for many cultures, including the Moche and spectacular finds are being made. 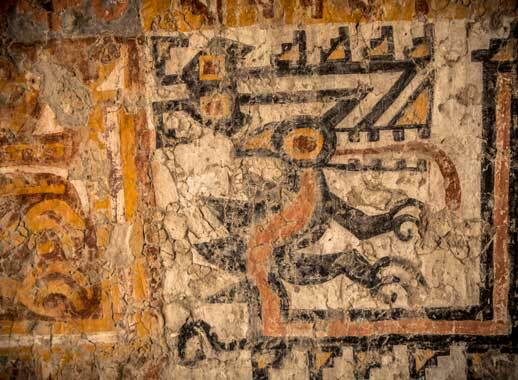 Among them are polychrome relief murals and, most significant of all (so far! ), the burial of the Lady of Cao (La Señora de Cao). Her mummified body, covered in tattoos of snakes and spiders, has been transferred to an excellent purpose-built museum at the site. After lunch you will continue your journey north for about 3 hours to the city of Chiclayo, where you will stay at the Costa del Sol Chiclayo. 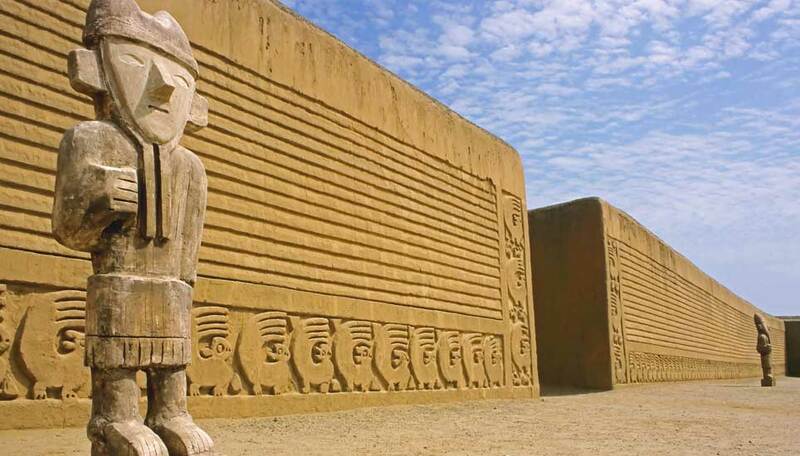 Chiclayo, like Trujillo, has several important archaeological sites in the nearby coastal lowlands and you will visit some on this tour. 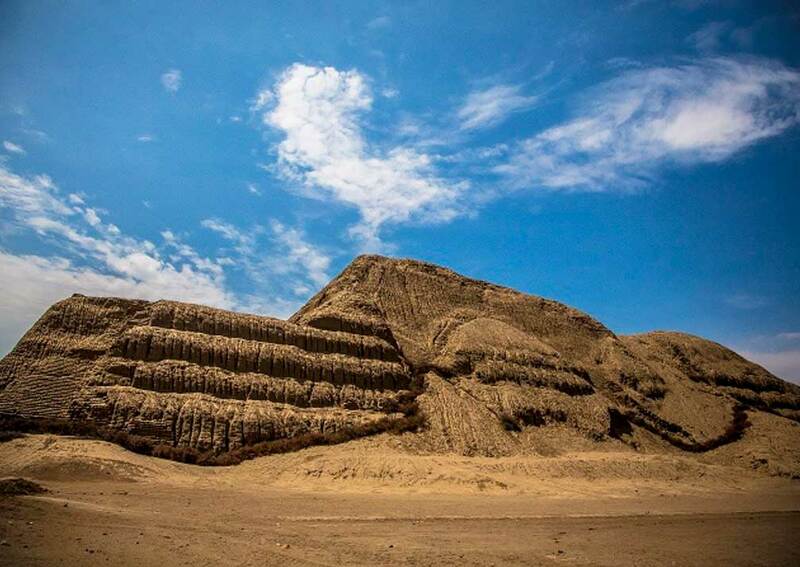 At Sipán, a group of enormous adobe-brick pyramids, the Huaca Rajada was found in 1987 to contain unlooted tombs of high-ranking Moche nobles, filled with some of the finest pre-Columbian Peruvian art ever discovered. 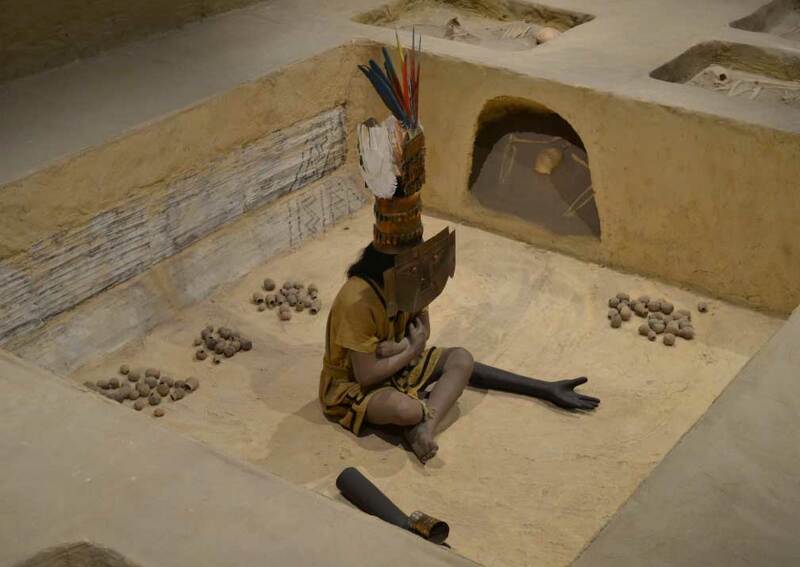 You will visit the site museum here, but the pieces themselves you will see this afternoon in Lambayeque. Before that you will return to Chiclayo and carry on to Túcume, another vast city with the longest abode structure in the world. It was built by the Lambayeque (also called Sicán) people before being taken over by the Chimú and, later still, by the Incas. 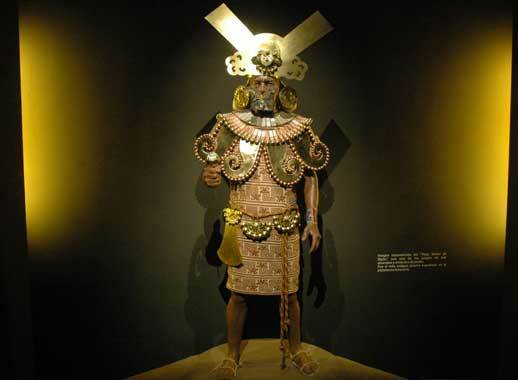 After lunch at a local restaurant you will go to the colonial town of Lambayeque, where the fabulous finds from Sipán are housed in the unique Museum of the Royal Tombs, created especially to display them to best effect. 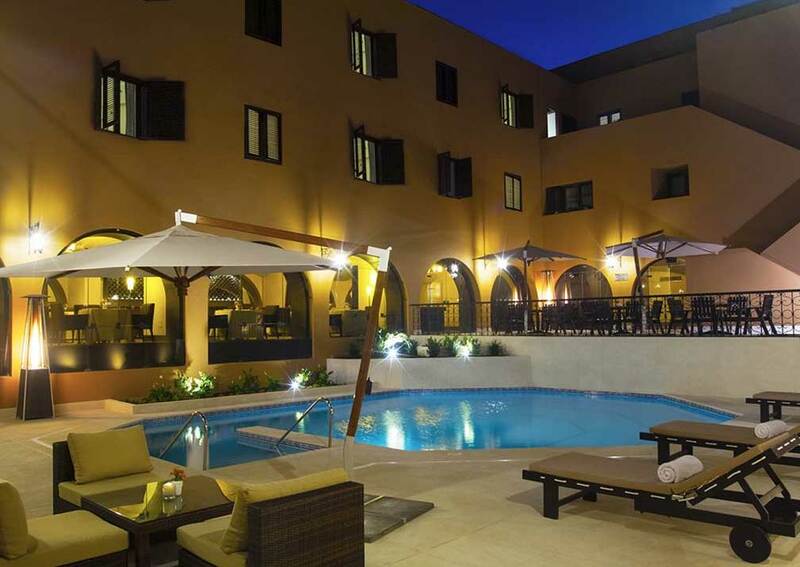 After the tour you will return to the Costa del Sol Chiclayo. Today you will travel by road from Chiclayo to Cocachimba, your home for the next three nights. 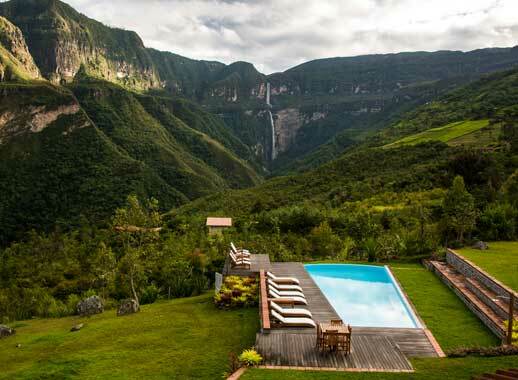 You will be staying at the Gocta Andes Lodge (at 1,796m), which has views of the waterfalls you will visit tomorrow. All the rooms have a balcony or terrace and the hotel has gardens and a swimming pool. 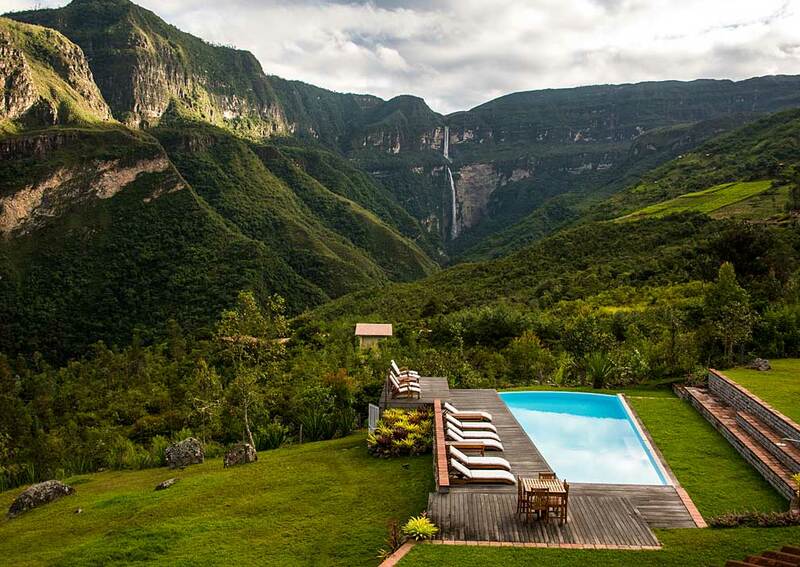 From the lodge you will have seen the falls, at 771m one of the highest in the world, and today you will trek to them through Andean fields and orchards and gallery forest. It’s about 2 hours each way. 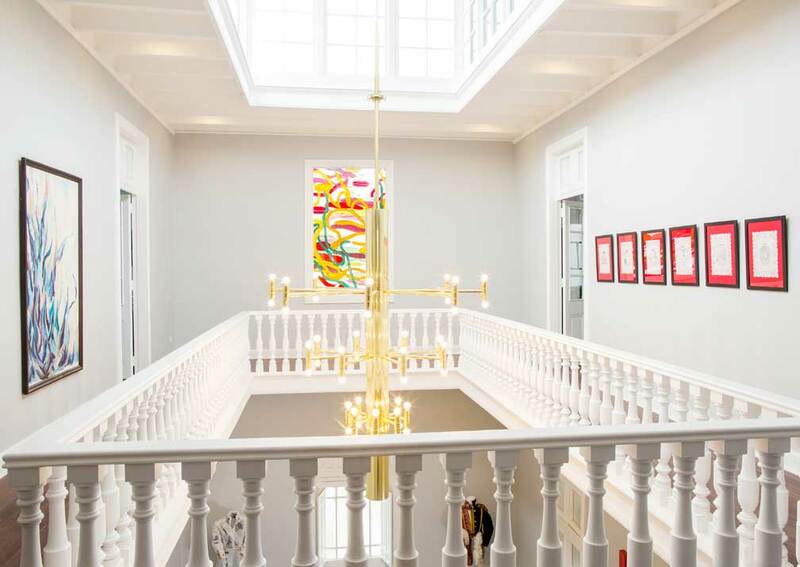 On your return to the lodge you will have lunch and then the afternoon is yours to relax and enjoy the surroundings. 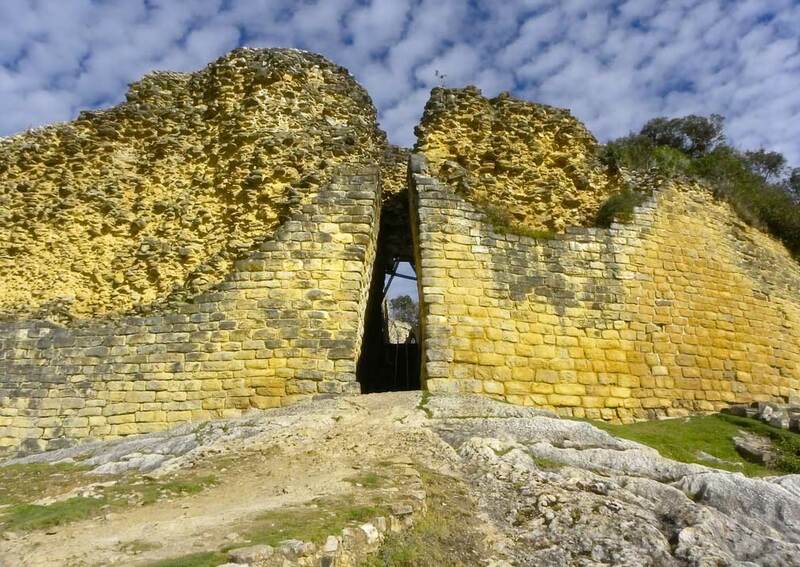 Kuélap is the magnificent fortress city of the Chachapoyas, the Cloud People. It stands on a hilltop at 3,000m and was occupied from about 500 AD until the time of the Incas. Inside its massive walls are small houses, a temple and other structures, most covered in bromeliads and mosses. To get there you drive from Cocachimba along the Utcubamba River Valley to the village of Tingo, where you will climb aboard the cable car that goes up to the fortress. 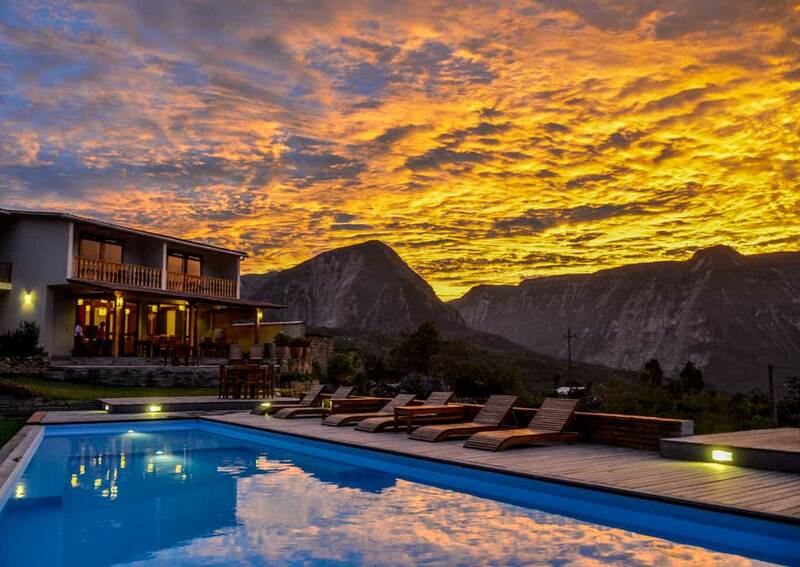 You will have a private guided tour of the site and then transfer back to the Gocta Andes Lodge. This morning you will go by road from the Gocta Lodge to the small northern city of Jaén, about 3½ hours away, from which airport you will fly to Lima. 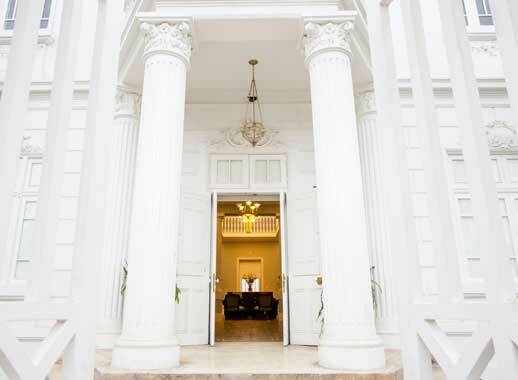 You will be met at the airport and taken back to the Casa República Hotel in Barranco. 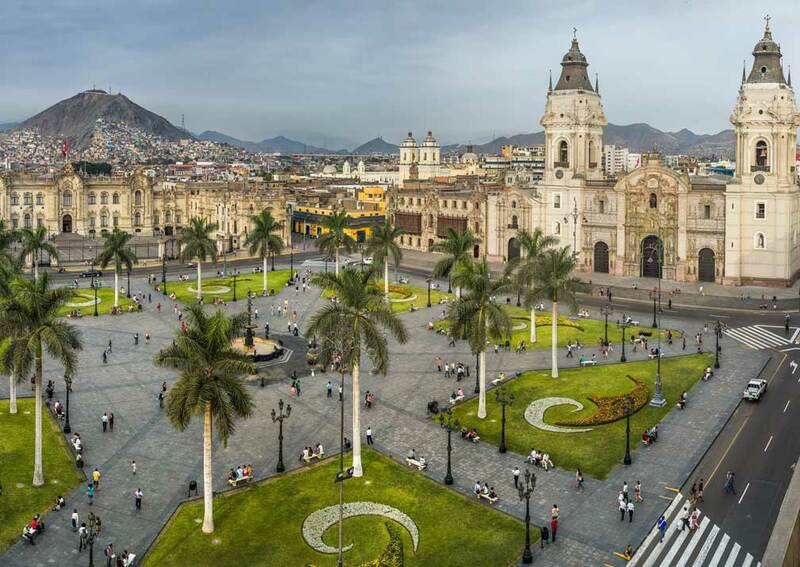 On your last day in Peru you will have a half-day city tour, starting at the colonial Plaza de Armas in the centre. The square is dominated by the 16th century cathedral and is surrounded by other historic buildings, many with grand wooden balconies. From here you will walk a couple of blocks to the Casa Aliaga, a Conquistador’s mansion, which has been in the same family since the 16th century. From the old centre you will be taken to Pueblo Libre district and the Larco Museum, in a converted colonial mansion. 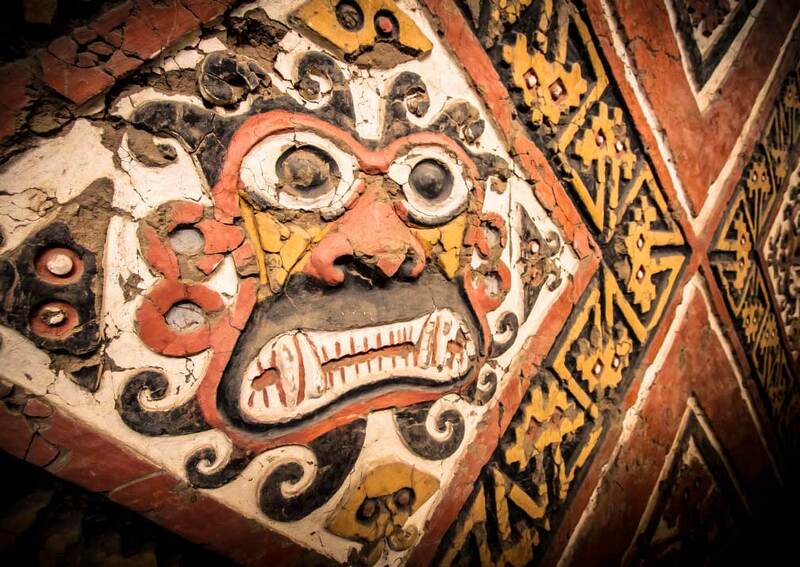 Its impressive displays of pre-Columbian art include a gallery of gold and silver objects and the famous collection of ceramics, a major part of which comprises erotica of startling realism. Afterwards you will be transferred to Lima airport for your flight home. Guide price from (pp sharing): 2019 prices from £2,405 based on travel throughout 2019. 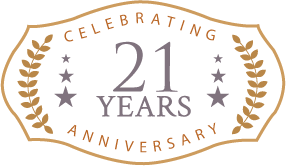 Includes: Private transfers; 9 nights twin share accommodation; meals as shown; private guided tours as shown with English-speaking guide including entrance fees on tours.